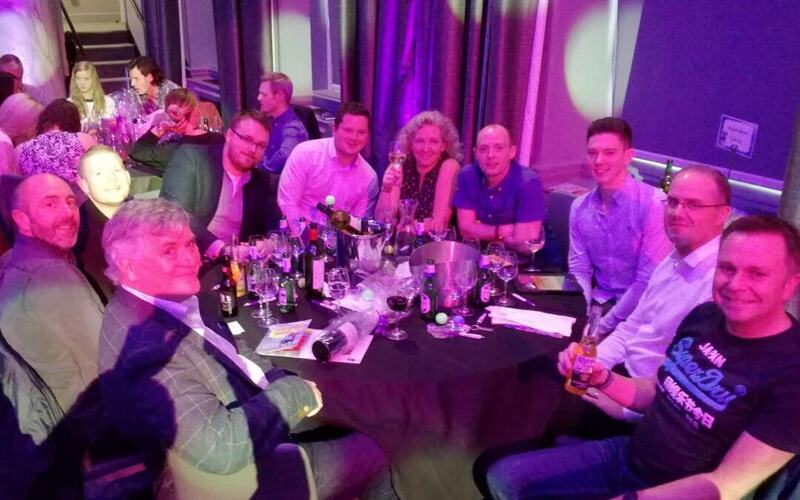 Thomson Gray were delighted to attend the 2018 Big Charity Quiz of the Year. The event, sponsored by MacRoberts and QTS was held in support of the Glasgow Children’s Hospital Charity. Taking place at the Grand Central Hotel in Glasgow, the quiz raised vital funds to support children and their families through difficult health issues. Congratulations are due to the successful team from Chivas Regal UK, who were crowned as champions for 2018. They were quite literally ‘crowned’ with Glasgow traffic cones! We’re very proud of our own John Cartwright, Ken Fraser, Duncan Scott and Wes Bathgate. The guys made up Thomson Gray’s contingent of the ‘Simple Minds’ quiz team. Being a clever bunch, they managed a very respectable joint 4th place! Our chaps can’t take all of the credit, though. They were ably assisted on the afternoon by David Ellis (The Ross Development Trust), Lorraine Robertson (HLM Architects), Allan Cooper (Cowiesburn Commercial Property Managers), Alan Joyce (FES), Steve McCabe (Hulley & Kirkwood) and Michael Gallacher (Abstract Securities). A big thank you to all of you for helping make this such an enjoyable afternoon. At Thomson Gray, we like to give something back to the communities we work in. We were delighted that you all gave up your time and brain power for such a vital cause.